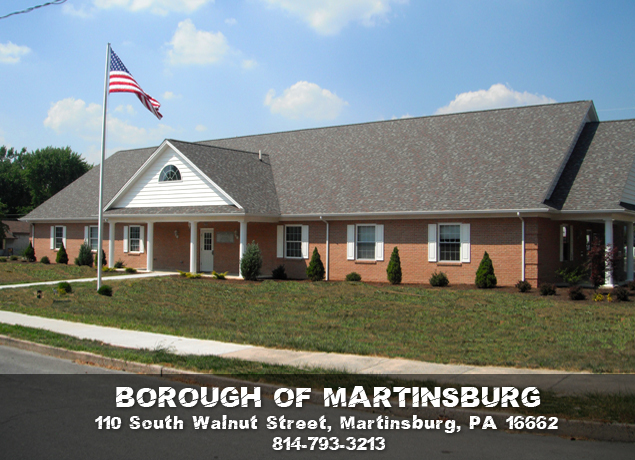 The regular meeting of the Martinsburg Borough Council was held on Tuesday, January 3, 2012, in the municipal building. The meeting started at 7:00 p.m. with prayer by Randy Stoltz and the Pledge of Allegiance. Prior to the meeting, District Justice Craig Ormsby administered the Oath of Office to three council members-elect: Connie S. Lamborn, Daniel R. Smouse and Shawn D. Daughenbaugh. The meeting was then called to order by Mayor Rex L. Hartman. Mayor Hartman assumed the chair for the purpose of designating officers. Nominations were taken for the office of President. Connie Lamborn being the sole nominee was voted president on a motion by Linda Smith, seconded by Ed Bennett. The motion passed unanimously. Nominations were taken for the office of Vice-President. Doreen Easly being the sole nominee was voted Vice-President on a motion by Dan Smouse, seconded by Durban Metzler, The motion passed unanimously. Nominations were taken for the office of Pro-Tempore. Durban Metzler being the sole nominee was voted Pro-Tempore on a motion by Doreen Easly, seconded by Dan Smouse, The motion passed unanimously. Dan Smouse reported that December 29, 2011 was the eighth year anniversary of the Hollidaysburg American Legion Ambulance Service in Martinsburg. The MINUTES of the regular meeting of December 5, 2011, were approved on a motion by Linda Smith, seconded by Durban Metzler. The motion passed unanimously. The MINUTES of the special meeting of December 19, 2011, were approved on a motion by Ed Bennett, seconded by Linda Smith. The motion passed unanimously. The FINANCIAL AND TREASURER’S REPORTS were presented for December 2011 as written. The LIST OF BILLS for December 2011, check nos. 6291-6337 in the amount of $54,251.19 was approved on a motion by Doreen Easly, seconded by Linda Smith. The motion passed unanimously. Council on a motion by Durban Metzler, seconded by Linda Smith, voted to close out the Building Fund and transfer the balance to the Building Maintenance Fund. The motion passed unanimously. Council on a motion by Dan Smouse, seconded by Ed Bennett, voted to close out the Ambulance Building Fund and transfer the balance to the Building Maintenance Fund. The motion passed unanimously. Mayor Rex Hartman reported that he will be donating his mayor’s stipend to the Christmas Light Fund. Chief Kerry Hoover presented the police report as written. He thanked the council for reappointing him to his position. The December complaints are down but they are taking more time to investigate than usual. Chief Hoover is thankful that the ministerium has taken over the toys program. They had a very successful first year. Chief Hoover gave Huston Township the policing proposal. Huston Township is also meeting this evening and will review the agreement. Patrolman Eric Hetrich has resigned and moved toReading,Pennsylvania effective December 23, 2011. One of the other part-time officers has taken on a 35 hour per week job in Cresson and his availability will be limited. The department will be doing interviews and they hope to have one or two applicants to be considered for approval at the next council meeting. Connie Lamborn reported that the ministerium was very successful at getting volunteers to help them with the Cove Christmas Love toy program. Durban Metzler inquired about the new junior license law limiting the number of passengers in the car and wondered if it will make more work for the officers. Also the upcoming ban on texting while driving was mentioned. It was reported that the texting ban has already gone into effect January 1, 2012 for commercial drivers imposing some serious fines. Manager Randy Stoltz reported that the new projector and screen was installed in the conference room on December 6 by Bettwy; a water class was held in the conference room on December 7 – there were four presenters – the projector was a very nice addition to the class; the Community Fund Drive has brought in 80% of it proceeds so far totaling $32,000 — $39,000 is needed to fund all of the allocations. President Lamborn announced that council should fill out the 2012 W-2 Forms and Earned Income Tax Residency Forms included in their packets. Solicitor Matt Gieg thanked council for reappointing his firm. Correspondence is included in the council packets regarding voting by phone. Having carefully researched the issue Attorney Gieg informed council that it is in fact permissible for council members of a borough to participate and vote by phone. Commonwealth Case No. 2007 Mazur v.TrinityAreaSchool validates the law. Attorney Gieg received confirmation from Andrea Cohen that the partners have agreed to allow the borough to take over the roadway that runs past Ed’s Riverside from W. Penn Street to W. Allegheny St. Two estimates for repairing the roadway were received from New Enterprise Stone & Lime Co.: 1) 5” mill and replace and 2) patch potholes and mill 2”. Connie Lamborn can still foresee problems with taking over the roadway regarding delivery trucks, parking issues, and paving issues. Attorney Matt Gieg mentioned that a formal deed of dedication will need to be executed and the $1,000 contribution must be paid by the Cohens before it can be officially taken over. The bank driveway will remain open to the street and has been there since about 1976. Speeding on the roadway will be a concern when the potholes are fixed. The next step will be to get the roadway surveyed. Once the $1000 contribution is made then it can be put out for bid for paving. It was suggested that Stiffler and McGraw Associates do the survey. Council on a motion by Ed Bennett, seconded by Doreen Easly, approved to go forward with taking over the roadway and allow Manager Stoltz to contact Stiffler & McGRaw and Associates to ask them to do the survey. Liquid fuels money cannot be used for the engineering cost. The motion passed unanimously. Attorney Matt Gieg will contact the Cohens and request the $1,000. Manager Stoltz reported that once that roadway is taken over as an official borough street, the borough will be receiving $220 each year from the Highway Liquid Fuels Fund. The Flood Plain ordinance was properly advertised and ready to be considered for adoption. Council on a motion by Doreen Easly, seconded by Ed Bennett, voted to adopt Flood Plain Ordinance No. 2012-587. The motion passed unanimously. A copy of this ordinance will be forwarded to the appropriate agency. The annual Christmas tree pick up is scheduled for Thursday, January 5, 2012, at 8:00 a.m.
Council on a motion by Dan Smouse, seconded by Durban Metzler, adopted Emergency Operation Promulgation Resolution No. 2012-0103-01. The motion passed unanimously. Chief Hoover reported that Councilman Shawn Daughenbaugh already has his NIMS certifications and has filed a copy of them in the office. Shawn is actually qualified to instruct the NIMS class. The 2012 Engineering Agreement from Stiffler, McGraw and Associates, Inc. was approved on an as-needed basis on a motion by Durban Metzler, seconded by Doreen Easly. The motion passed unanimously. Council on a motion by Linda Smith, seconded by Dan Smouse, adopted Resolution No. 2012-0103-02 acknowledging Cindy Myers’ 29 years of service with the borough. The motion passed unanimously. The 2011 Annual Report of the Martinsburg Volunteer Fire Company was received. Council on a motion by Doreen Easly, seconded by Linda Smith, approved to expend $250 from the General Fund for a gift for Cindy Myers in acknowledgement of her 29 years of service. The motion passed unanimously. There was an inquiry to purchase some new Christmas street light decorations. Manager Stoltz reported that each decoration cost about $400 each. Linda Smith inquired if there should be some consideration of lowering the speed limit on Spring Street from 25 mph to 15 mph in response to the recent pedestrian accident. Sgt. Justin Davis responded to her inquiry in that speed was not an issue in that accident. An 87 year old driver crossed over two driving lanes and veered off the road and hit the pedestrian. The meeting adjourned at 8:15 p.m. on a motion by Doreen Easly, seconded by Ed Bennett. The motion passed unanimously.